As we revel in really, really big numbers, we might spare a thought for Edgar Frank “Ted” Codd; he died on this date in 2003. A distinguished computer scientist who did important work on cellular automata, he is best remembered as the father of computer databases– as the person who laid the foundation for for relational databases, for storing and retrieving information in computer records. As we ponder the provenance of our produce, we might recall that it was on this date 1397 that Geoffrey Chaucer “told” The Canterbury Tales for the first time at the court of Richard II. “Infrastructure” is not a term conventionally used to describe the underpinnings of social life…[but] if states and societies do not recognize social infrastructure and how it works, they will fail to see a powerful way to promote civic engagement and social interaction, both within communities and across group lines. 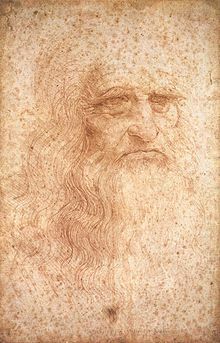 As we ponder the perception of permanence, we might send polymathic birthday greetings to someone who has so far transcended time– the painter, sculptor, architect, musician, mathematician, engineer, inventor, physicist, chemist, anatomist, botanist, geologist, cartographer, and writer– the archetypical Renaissance Man– Leonardo da Vinci. Quite possibly the greatest genius of the last Millennium, he was born on this date in 1452. As we call ’em as we see ’em, we might recall that it was on this date in 1939 that John Steinbeck’s The Grapes of Wrath was published. The story of the Joads, a poor family of tenant farmers driven from their Oklahoma home by drought, agricultural industry changes, and bank foreclosures forcing tenant farmers out of work. Fleeing the Dust Bowl, the Joads set out, with thousands of other “Okies,” for California, seeking jobs, land, dignity, and a future. Neighbors. Dir. Edward F. Cline/Buster Keaton. Perf. Buster Keaton, Virginia Fox, Joe Keaton. Metro Pictures, 1920. As he migrated from vaudeville stage to movie set, [Buster] Keaton realised the comedy itself did not need changing, though the opportunities afforded by the camera could extend the world in which the spatial interplay he had developed since childhood took place. As we take the fall, we might send delighted birthday greetings to Stanley Donen; he was born on this date in 1924. A Broadway dancer (who befriended a young Gene Kelly), Donen followed Kelly to Hollywood as choreographer, then a director– of such classics as On the Town (1949) and Singin’ in the Rain (1952), both of which starred Kelly who co-directed. Donen’s other films include Royal Wedding (1951), Seven Brides for Seven Brothers (1954), Funny Face (1957), Indiscreet (1958), and Charade (1963). Credited (with his rival, Vincent Minelli) with having transitioned Hollywood musical films from realistic backstage dramas (a la Busby Berkeley) to a more integrated art form in which the songs were a natural continuation of the story, Donen is highly regarded by film historians.